RancherMan loves bread in all forms and we always have plenty of bread in the house. But sometimes it’s hard to plan the purchases where the bread will be completely consumed while it’s at its freshest. Sometimes even with careful planning the bread will get hard & stale. There are many things I like to do with the bread to make sure it’s all put to good use, but RancherMan’s absolute F-A-V-O-R-I-T-E thing for me to do with it is make French-Bread Pizza. It’s quick, it’s delicious, and it utilizes bread that would have otherwise been wasted. What’s not to love?? You can use tomato paste or even pasta sauce for the tomato base. But I had frozen garden tomatoes in the freezer I needed to use. So I pulled a few bags of frozen garden tomatoes from the freezer and allowed them to semi-thaw. When they’re still partially frozen the skins slip easily from the tomatoes. I’ll dehydrate the tomato skins later to make the tomato paste for another time. Right now my focus is on those semi-frozen skinned tomatoes. So I drain & chop up those skinned tomatoes, toss them into a saucepan and cook them with about 2 tablespoons of pesto from the freezer and some oregano from my garden. While I’m chopping the other veggies for the pizza, the tomatoes simmer until much of the moisture is gone & they are thick as paste. Now I’m ready to assemble the pizzas. I pull out my meat slicer since by using it I’m able to uniformly slice the bread as thick as I like it. These thick slabs of bread will become our pizza crusts. 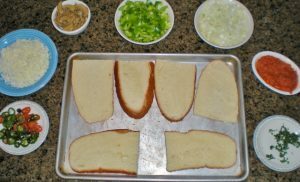 I start by cutting the french bread loaf in half and then slicing each half lengthwise into about 1/2″ slices. This will make individual pizzas so each diner can doctor it up to suit their tastes. But you can just slice the loaf longwase and make each side into a pizza if everyone wants the same pizza! I lightly coat each crust with olive oil then put them in the oven on the highest broiler setting so I can toast the bread slightly. That step makes for a less soggy crust when the toppings are added. Then I bring them out, add a layer of tomato paste & load the pizza with our favorite toppings – onion, bell pepper, jalapenos, mushrooms, fresh oregano and mozzarella cheese. One more quick stint back in the oven melts it all together and VOILA – French-Bread Pizza! It’s so much quicker than making pizza crust from scratch and so much less expensive than ordering pizza. Plus we get the toppings we like in the quantities we like. YUM! They say the quickest way to a man’s heart is through his stomach, and my man loves his PIZZA! This entry was posted in Blog Posts and tagged Cooking, Frugality, Make-It-Yourself, Recipes on October 18, 2013 by Texas Homesteader. I love french bread pizza!! Thanks for sharing on My 2 favorite Things on Thursday – link Party! Hope to see you again this week! Pinned! YES! Who doesn’t love pizza? And when you can make it this quick, well that’s a winner. I could eat pizza every day and be happy! Pinned and scheduled to share with my Facebook readers! Visiting via No Rules Weekend Blog Party! Awesome Trisha, thanks for the pin. Now that looks yummy! A great way to use up day old french bread. RancherMan will be inclined to agree with ya there Brenda. This sounds really great! 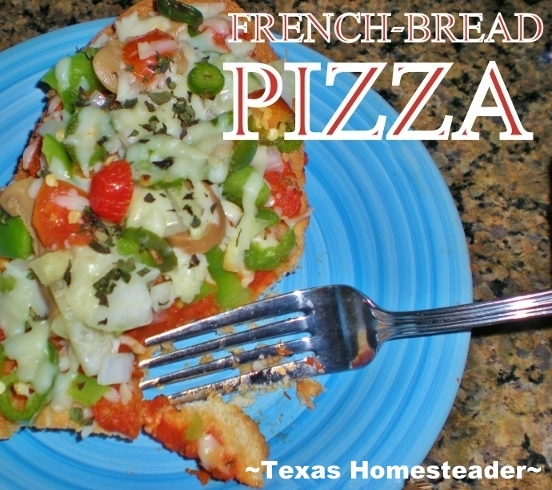 I love French Bread pizza and never thought to make it at home. Thanks for linking to the In and Out of the Kitchen Link Party! I am always glad to see you! I’ve been thinking about getting a MISTO! This makes me want to go ahead and get it! Thanks for sharing at Share Your Stuff Tuesdays! This is making me hungry!!! I love pizza made this way, and I also sometimes use corn chapatis and top them with pizza ingredients. It is time for lunch, so now ‘Thanks to you’, I will make some for lunch :0 Have a great rest of the week!! Blessings! I remember these growing up! It’s amazing as you grow up how you forget these yummy treats. Thank you for sharing. Nice! I have done it on baguette before, but that’s a lot of bread compared to pizza toppings. I will try this next time. Thanks for sharing. I love French Bread pizza! So easy to make for one since I’m single! Thanks for sharing at TTF!